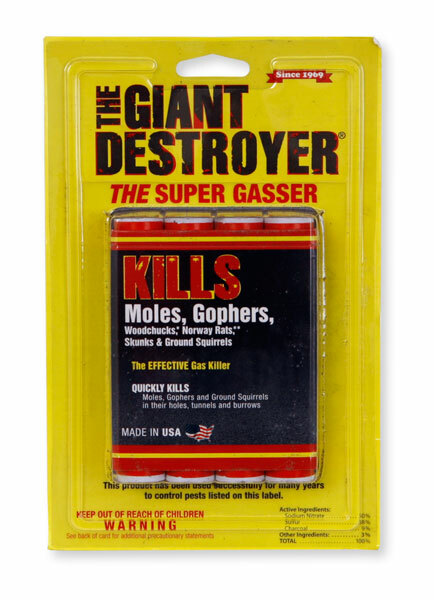 Can we use the Giant Destroyer in a skunk den under the front step of our house (against the foundation)? We have a skunk den under the front step of our home. Can we use the Giant Destroyer to gas it? Would it be safe to use the product against the foundation of the house? It really depends on where the smoke would go in most cases I would expect that it could get sucked into the house by a door, vent, etc. I really don't recommend using it within close proximity of a house as it poses to much of a risk. If you decide to try it, just use 1 and be extremely diligent on how it is used. The next question is, if you decide to use it and the skunks get flushed out, what is your plan? Unless you shoot them (illegal in most cities, towns, etc) they will almost certainly spray. With them being close to the house the odor could cause another entirely separate issue. Trapping them is the best removal method. This can be done without using smoke bombs.